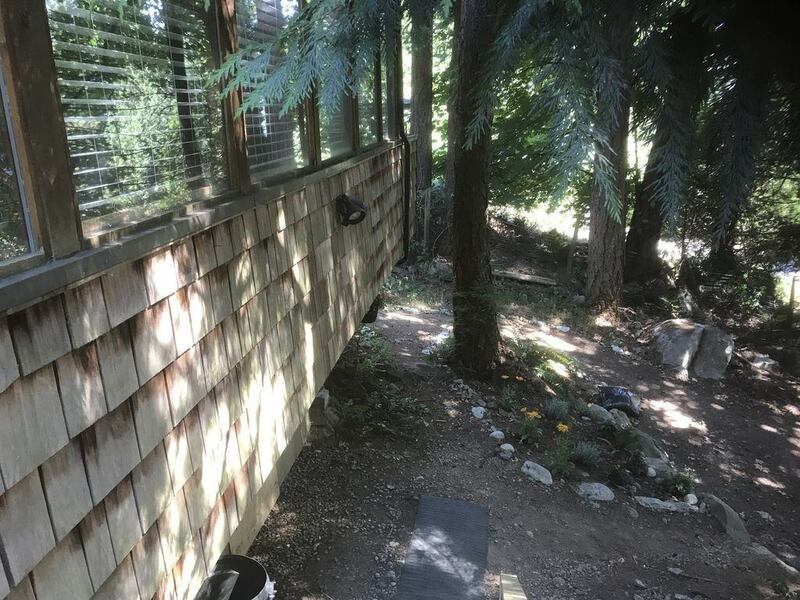 This post is written by Jan Stevens​, owner of Bowen Island Accommodations, and a professional residential interior designer of over 40 years. For the past 14 years Jan has specialized in Vacation Rental Interior design and marketing. You can view her portfolio at JanStevensDesign.com. 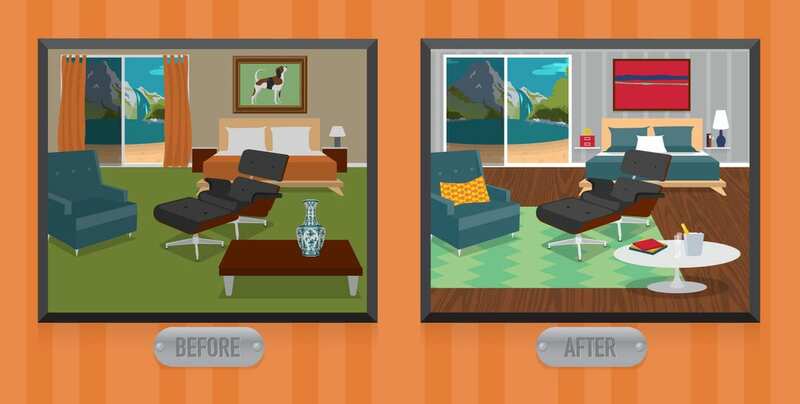 ​As both a designer and a vacation rental manager, I have seen how interiors directly affect rental income. Not everyone goes into vacation rental management with a design background though, and small mistakes in furnishings, décor, staging, and photography can have huge financial impacts. The reverse is of course, that great design has great benefits. ​In this post, I'll explain why ​I believe property owners and managers should consider investing in the interior aesthetics of vacation rental properties, and how doing so will ​yield​ results ​in ​the bank account. "I have good taste, I can do the design work myself.” Are you sure? Many home owners take on the design work themselves and either think it's not a big deal… doing it quickly and without thought… or do it with the idea that they have good enough taste without asking for another set of eyes to verify. 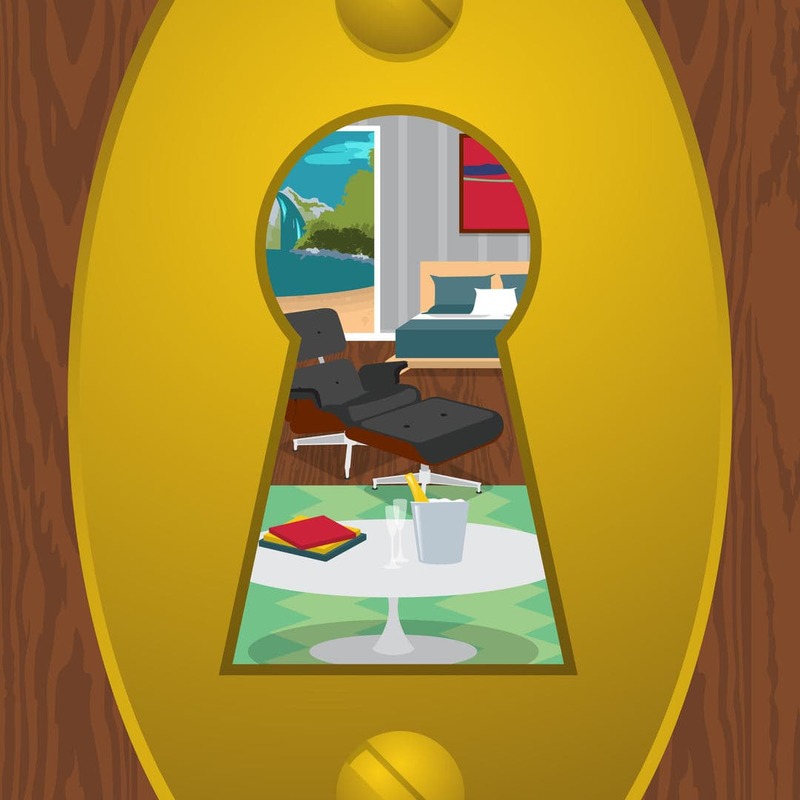 Design is somewhat subjective, but there are many aspects of design for attracting guests that are solid and hard to dispute. ​Does the décor show the property to its best potential? It doesn’t matter if it is rustic or high-end…….​both version needs to be aesthetically pleasing and reflect the market that the property appeals to. ​Does the color palette flow from one room to the next, creating a unified property? ​Does the décor beg for the traveler’s attention with a unique color palette or maybe another surprisingly brave interior element that a guest would be thrilled to experience? ​Does the property look like IKEA or Costco furnished it……..just like your competition? I am hoping not. ​Is the property too cluttered or even too sterile? Is there a clean and homey balance? ​Are some of the furnishings shabby and worn? ​Were the presentation details attended to before the photos were shot? ​As much as we pay attention to our listing keywords, writing our full listing text, managing our rates, supplying amenities, I believe one needs to consider the functionality and aesthetic appeal of their vacation rental as well. Recently I was thrilled to have a 3-week VRBO Instant booking for next summer. Score!!! Although the celebration ended as soon as the guest read our rental agreement and discovered that his Mercedes mobile home could not make it down our AWD driveway. I asked the guest, what we could do to ensure that potential travelers read the listing so they would be informed about the driveway. 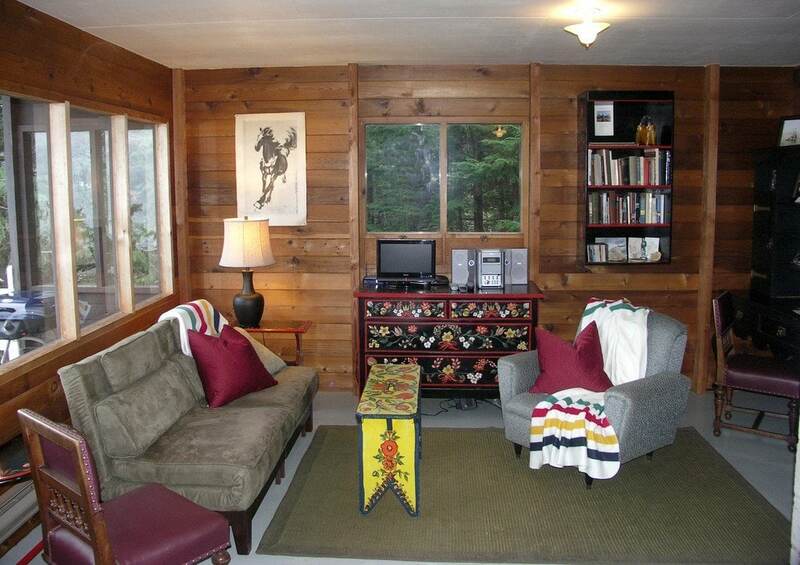 He apologized and said, "So sorry, the photos and décor were so good that I didn’t read the listing at all." This is an extreme example of a guest being influenced by an attractive décor captured in photos. Pictures and an inspiring interior do speak a thousand words. One way that focusing on proper design will keep money in your pocket is by only going through the design and photography process once. Having spent time and/or money achieving professional design, (followed by professional photography), you will get the décor and interior shots right the first time. Having regrets after you view your final photos can be expensive. Needing to do a reshoot because of one or two design or staging mistakes is not a good use of your time ​or money. Ideally reshoots should only happen when you replace major furniture, do renovations, or change the overall look of your home. The camera zeros in and frames the good and the cluttered or shabby. Make it right before you shoot, by having that keen-eyed friend or a designer there to help you with your home's look, and stage the shots to perfection. The dinner you buy for your friend or the consulting fee you pay a designer to help fine tune your décor will make you more competitive, win more bookings, and ultimately earn more income from your vacation rental. I promise, your return on the expense will result in more bookings -- it is money well spent! Even if you're not design-inclined, at the minimum, most owners know that their "​cover shot" (the one photo that represents their rental on listing sites), is key to snagging renter interest. Having a designer (or your helpful friend) there for the staging before bringing in the photographer is worth it. A photographer will not necessarily do staging. A designer or talented friend can help you not only with the décor of the shot content, but has the know-how to stage the shot with just the right placement of items that conveys a story of romance, relaxation, or invigoration, allowing guests to picture not only being there, but enjoying being there. Your critical-eyed friend or experienced designer ​has the technical knowledge to walk into your space and visualize what would be impactful in a 1 x 1-inch thumbnail photo, as seen on listing sites. They can make adjustments so that the composition is minimal, but impactful. They can also assist you to pick your best feature, and even if that's an exterior one, such as a view, they know how to frame a shot with a bit of railing or from inside looking out to tell the story that "this view does belong to this property, and you, the guest, could be gazing out at it." What's in your ​cover shot, how it was staged, and the quality of the shot – all design issues – can make or break your property's performance compared to the competition, and the competition is greater than you think. It may be the single most important marketing choice of an entire vacation rental marketing portfolio. Today with the listing site search features you are not just competing for vacationers in your locale -- you are competing against vacation rentals worldwide. Below are the search results for Bowen Island, a tiny island just 20 minutes from the shores of Vancouver, BC. Yes, it is where my vacation rental property is located and it serves as an excellent example of my point. With the implementation of VRBO’s “Best Match” the travelers are shown examples of vacation rentals in the matching price range, guest count and other amenities with no regard to destination. I agree, it doesn’t make sense to me but considering that it is a fact, it broadens the competition net and no longer shows just YOUR destination to travelers. You can see that the traveler is shown vacation rentals across Europe, the US and even south of America. 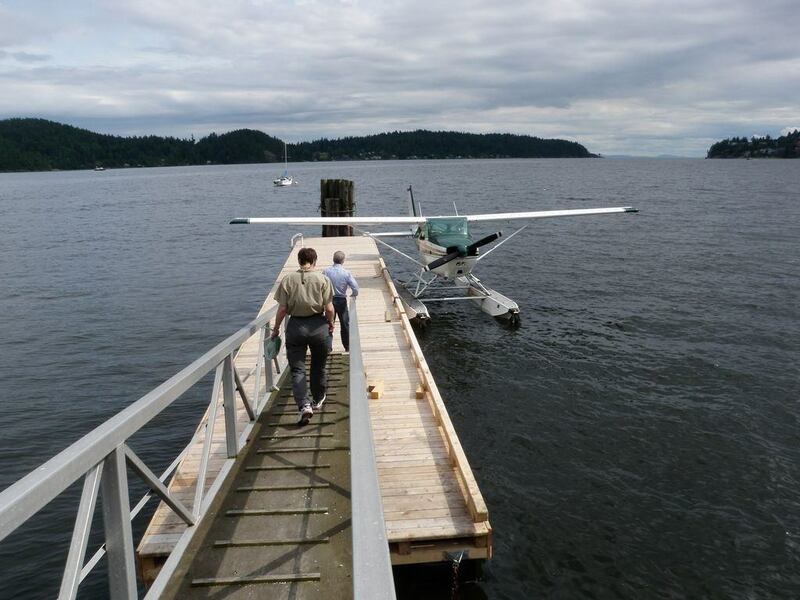 ​The traveler is tempted by other destinations and considers going to Anna Maria Island rather than Bowen Island. How will you hold their attention? An eye-catching ​cover shot that leads to an attractive or inspirational interior just might do it. ​Even though the traveler intended to vacation on Anna Maria Island, they found Bowen Island, loved the décor and style of the thumbnail ​cover shot…they changed their destination. The attractive interior was the deal breaker. Potential guests were hoping to stay out in the outer islands and during their search the Lazy Bowen Hideaway popped up as a choice. They were attracted to the Hideaway décor and ended their search for a remote island destination. They stayed for 7 nights and left a very complimentary review. Our second example was a couple from Texas doing a broad search for the North West of the US, something cooler and greener than Texas in the heat of summer. 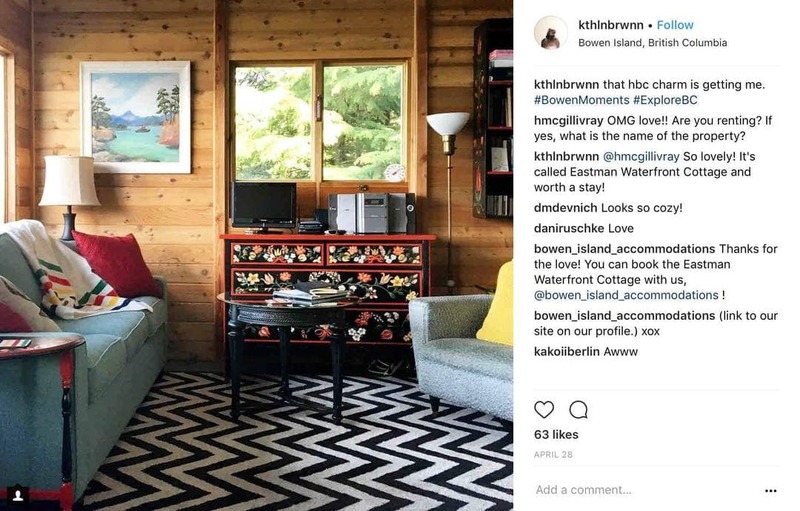 When I asked her how she found Bowen Island and the Lazy Bowen Hideaway she said it was a regional search and they fell in love with the Hideaway décor photography. Even without the distraction of other destinations, there is still plenty of competition in your locale. Let’s say the traveler really wants to stay in your location, so they tighten the search to their intended vacation destination. Both VRBO and Airbnb will still tempt the traveler with a range of options within a 50-mile parameter. It may be a smaller circumference around your property but you will still be surrounded by competition. 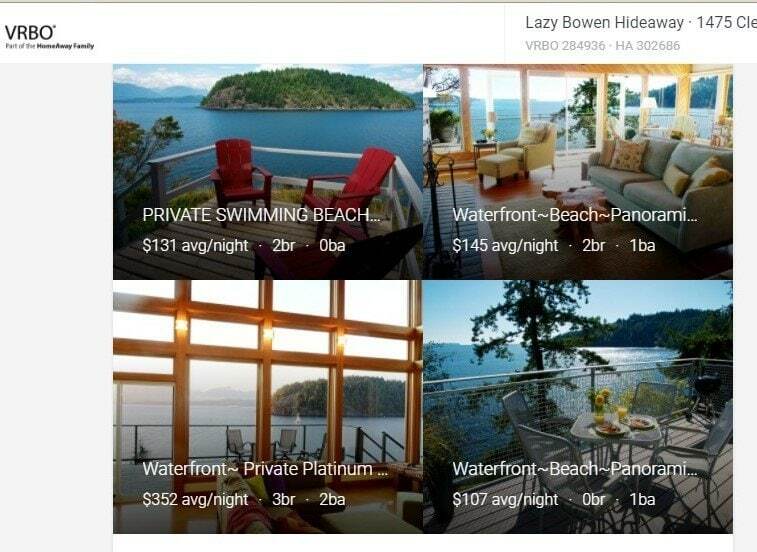 ​Below is a screen shot of a search for a Bowen Island property using Airbnb. One property shown is on Bowen and the rest are in the surrounding areas...the competitive circle is large. Which thumbnail gets your attention and why? It is good to note that search site algorithms can change, so you never know what property or location will pop up next to yours (in the past, I've seen properties from other countries appear next to mine). So make sure you​ thumbnail is competitive not just in your area, but ideally, worldwide. If the design bar is low in your area for vacation offerings, don’t try to meet that bar; exceed ​it by tenfold. Of course, ​there are other ways to compete with the wider world, but good design and spectacular ​photos that show off your good taste are important tools that can help you beat the listing site competition. The best way to gauge where you stand with your ​cover shot is to take the renter's viewpoint. Give it a try with your property and see if your ​Cover Shot stands out or is it lost in the sea of many? The competition is greater than one would expect and the way to make the best first impression is with a ​stunning photo that lets the viewer know what's special about your place right off the bat. ​Will your photo appeal to their dream vacation? ​Does it capture your strongest amenity? ​Is it a lake location with a broad sweeping vista? 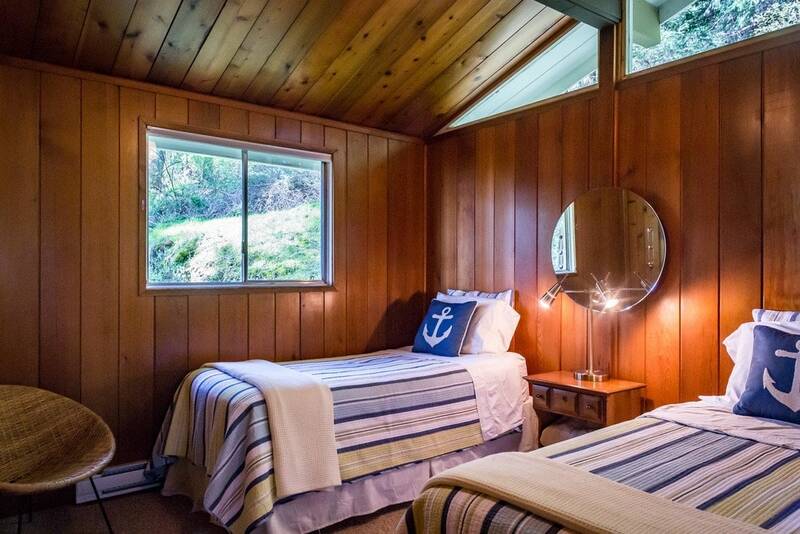 Or a panoramic of the Pacific Ocean with sandy beaches, even the quiet serenity of a secluded cottage in the forest? Whether it's a shot of an interior or exterior, make sure you feature your property's biggest draw. ​What makes your ​cover shot different from the rest? Is it unique from the sea of other thumbnails? Amp up the ​Cover Shot with a dash of color. ​This photo is an attention grabber year-round. The use of the red deck chairs in contrast to the bright blue water does not go unnoticed. Once we have their attention they then continue to view a one-of-a-kind interior. Going into our slow season the Eastman Waterfront Cottage continues to generate inquiries and the authentic Canadiana interior is a factor that helps secure the reservations. 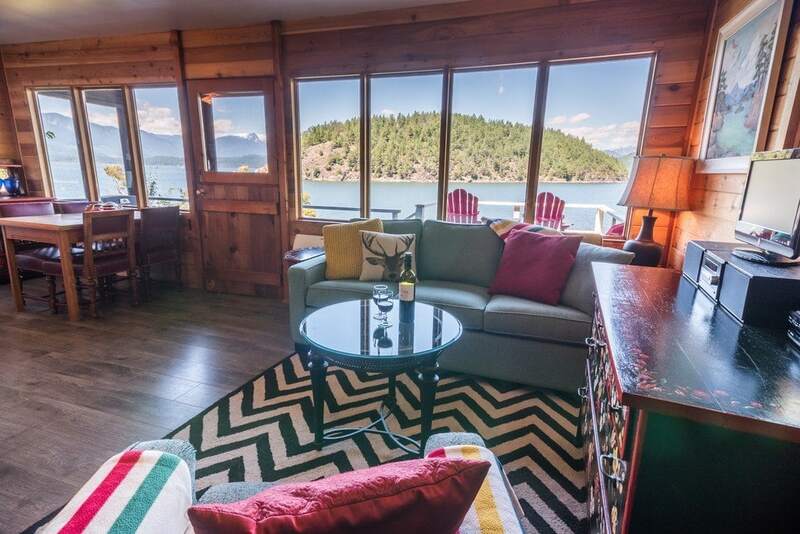 As of December 18, 2017 the Eastman Waterfront Cottage occupancy is 11% ahead of the other 5 ​Bowen Island Accommodations properties. I like to use a bright accent color (red being my fave) whether it is a pillow or two, deck chairs, or potted red geraniums. Keep in mind what looks good in a large photo on your screen may not look good on a small thumbnail that people will see on the listing sites next to many others. Also, be sure that the elements of the photo are recognizable at small size. Assuming you have successfully grabbed the traveler’s attention with your ​cover shot, now what? When you have their attention and they click on your listing, will they like what they see inside? Once they are viewing your listing, and your greater collection of property photos, will you keep their interest with a tasteful and inspirational décor? Let’s assume you do have professional photos showing your property in excellent light and at its best (so far). If everything else is nearly equal to your competitor such as nightly rate, amenities, and desirable location, what will tilt the visitor to book with you? I believe you will garner more inquiries and win more bookings with an appealing and attractive décor. Who doesn’t like good taste? This is another tool in your tool belt where you can win over your competition. An attractive décor is certainly in the eye of the beholder which is why (just in case you might not have a good eye) we ask you to get a talented friend or a designer to give you some critical feedback. Ultimately why not err on the side of well designed, comfortable, appropriate, and most of all, authentic. 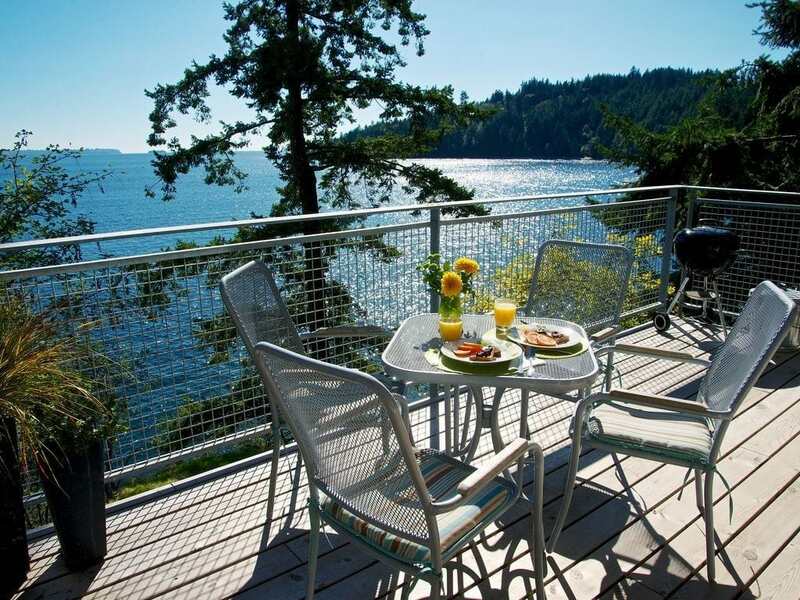 One of my newer Bowen Island properties had excellent high-season occupancy which by the way, is easy to do even with the un-sightliest property because of the excessive demand. The challenge was improving the very low off-season bookings for this vacation rental. 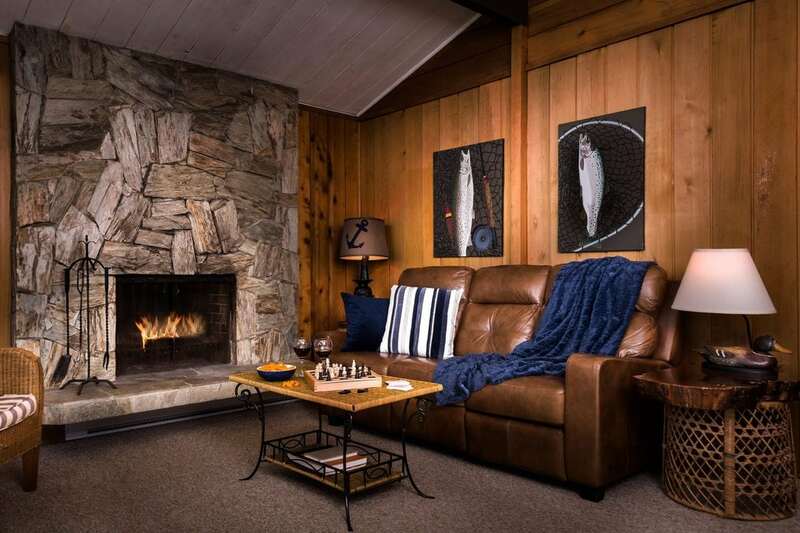 We discussed adjusting the nightly rate, providing firewood as a warm and cozy added amenity and restaging and reshooting the existing photos. ​The Before photo shows a less functional space with an old boom box sitting awkwardly on a too small table. The haphazard wall has no balance or focal point. Our new owner agreed to repurpose and restage her cottage. Since the budget was minimal my first course of action was to repurpose and edit what was already owned by creating new less cluttered focal points and improved functionality. A total of $388 was used to purchase pillows, cushions, a throw, and a few other accessories to add color punch and color unity to this property. It was a good start and the results were impactful. ​Updating the bedding says less grannie and more today. 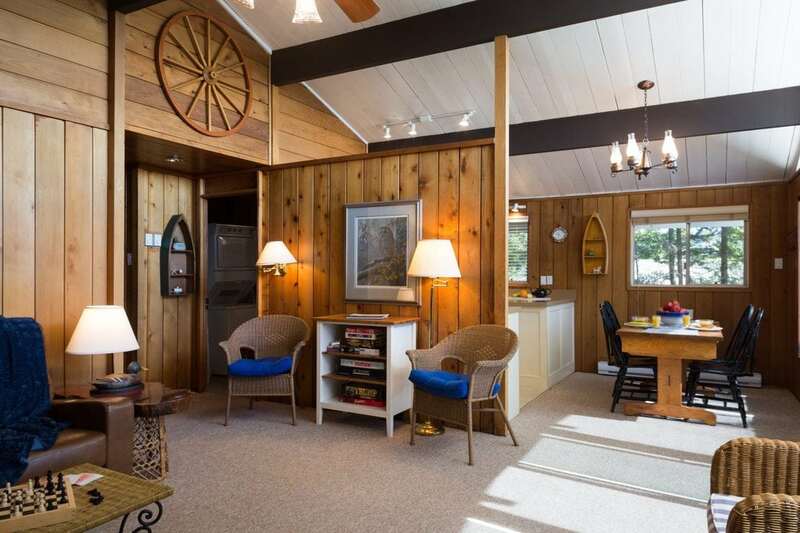 The warmth of the cedar wood walls is appealing but when everything from flooring, to sofa and end tables is the same color as “wood paneling” the interior becomes rather bland….too much caramel. We needed to add some special sauce to make the rooms POP. The complimentary color of blue was used to unify the cottage color palette and to add a cool balance of color to the otherwise warm color scheme. Red was chosen as the secondary complimentary color. Both added dimension and accented the previously monochromatic rooms. Small updates have yielded big results. Since taking over management of the Evergreen Cottage (October 2016) we are able to measure a 61% increase in the 4th quarter of 2017 over 2016. While there are other factors that have contributed to the increase, we do believe that the small inexpensive décor changes, the restaging and new photography has led to substantial income and occupancy gains for this property owner. If you are also having challenges booking your property in the off-season, ask yourself, with the many choices available to travelers during this time, will the traveler choose your property? Have you maximized your décor appeal to stand out from your competition? The above examples show that with a minor expense, repurposing, restaging and a photo re-shoot can make a difference in your occupancy and income. Back in 2013 when I entered the Eastman Waterfront Cottage I had to turn sideways to walk into the musty aged living room. I navigated past multiple sofas, chairs, chests, and dressers which made the small 500 square foot cottage a cluttered mess. 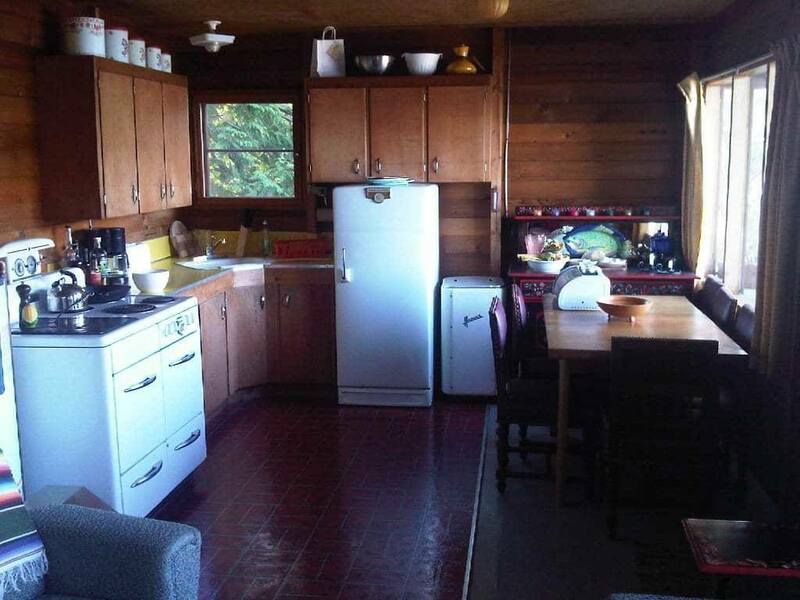 The previous manager was renting the property in this 1950’s jumbled, petrified and deteriorating state for $125 per night. It boggles my mind that this little diamond in the rough was even rentable. There was no listing site and no photos. Gosh, I would have loved to have seen the guest’s expression when they actually entered this property and saw for the first time what they had rented sight unseen. I can only imagine that if there was a ​cover shot, it wouldn't have stood out, except for winning the most-furniture-in-a-thumbnail prize. ​The Eastman Cottage living room in one of its original rental states prior to the interior being edited by Jan Stevens Design. Nothing was purchased, but rather furnishings were edited, eliminated and reorganized. The first thing I did was toss out the sun-rotted sofa with thread bare “heirloom” blanket. Nothing says “dust mites” like an ancient, shredded sofa. We made use of a new futon that would suffice until the budget allowed for the purchase of a new comfortable sofa. Next the old gold draperies and rods were pulled off the wall which left an unobstructed water view of the bay… as it should be. The hand-painted dressers that were lined up along the walls were relocated into the bedrooms... where they were most useful after all. Finally, the antique washing machine was removed. It was very charming but unnecessary and it took up space that would be better used as “blank space” in this tiny cottage. Just with this first phase of space planning and editing we were able to rediscover the charm of this Panabode cottage which enabled us to raise the base rate from $125 to $165… a 22% increase. With the cottage cleaned up (October 2013) we added a few Canadiana accessory accents to compliment the hand painted furniture and wall art (circa 1940) created by its original owner, Antonia Laribbe Eastman. While not yet perfect, the Eastman Cottage was ready for its preliminary photo shoot which was used to get the property listed and live on VRBO. The Eastman Cottage is a great example of how harnessing the power of good design, with minimal monetary infusion, can improve your bottom line. Investing in affordable and simple aesthetic improvements to your property will give you the opportunity to be considered and hopefully booked. The increased demand will justify raising your nightly rate. 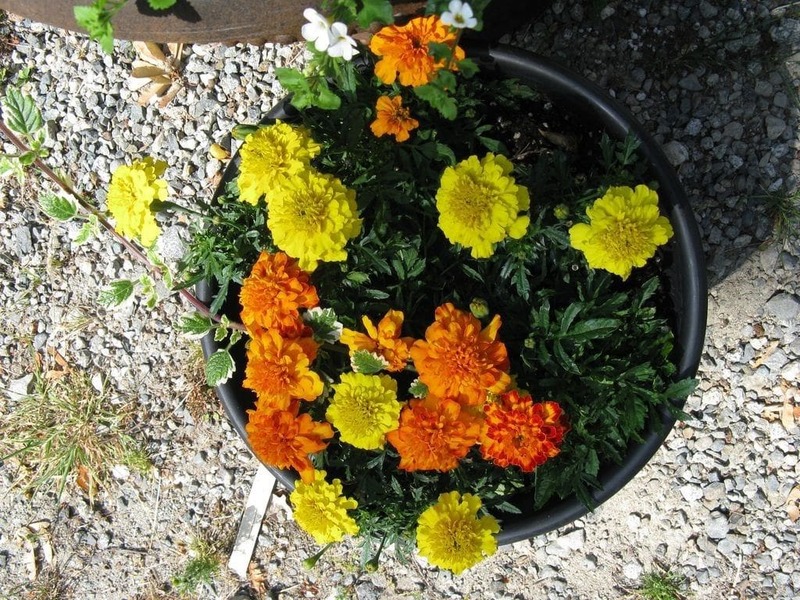 These improvements can benefit a no frills property as well as an amenity abundant property. With the quick and easy space planning and editing complete we then created a plan of action for further improvements. The phase one, cost-free aesthetic improvements, (which were having a positive effect on bookings) meant more money in the owner's account, making it possible to fund a long list of future improvements. I suggest you prioritize according to guest’s needs and desires, which requires a bit of mind-reading and traveler empathy. For concrete data ask the guest after check out, “How can we improve?” We have found this question gives the guest a place to vent or share their suggestions giving us the opportunity to show the guest that their input matters. We also prioritized improvements that would benefit the overall energy efficiency of the property. While these weren’t necessarily aesthetic improvements they did add to the owner’s bottom line and guest’s comfort. 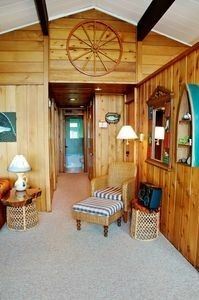 Replace multiple flooring of painted plywood and vinyl with insulated laminate flooring to visually expand the small cabin and to create a warmer floor for guests. Replace 1950’s original GE refrigerator with a more energy efficient model. Replace damaged yellow laminate counter with a durable surface made for vacation brained guests. Replace charming 1947 vintage Tappan range with a truly functional range. With the above listed improvements complete the demand is at record levels boasting a year-round average of 71% occupancy….an excellent occupancy considering the very cold 6-month rainy season. This has allowed us to continuously raise our nightly rates, starting at $125 and now $225 in the high season. An 80% rate increase since October 2013. 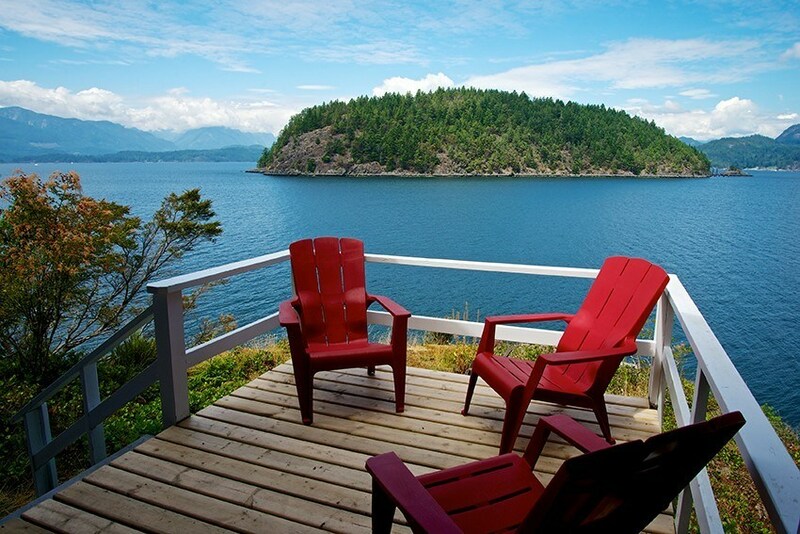 The current Eastman Waterfront Cottage is our most popular vacation rental on Bowen Island. To see more photos of this charming Canadiana cottage click here. Be sure to scroll down to see the before and after photos. 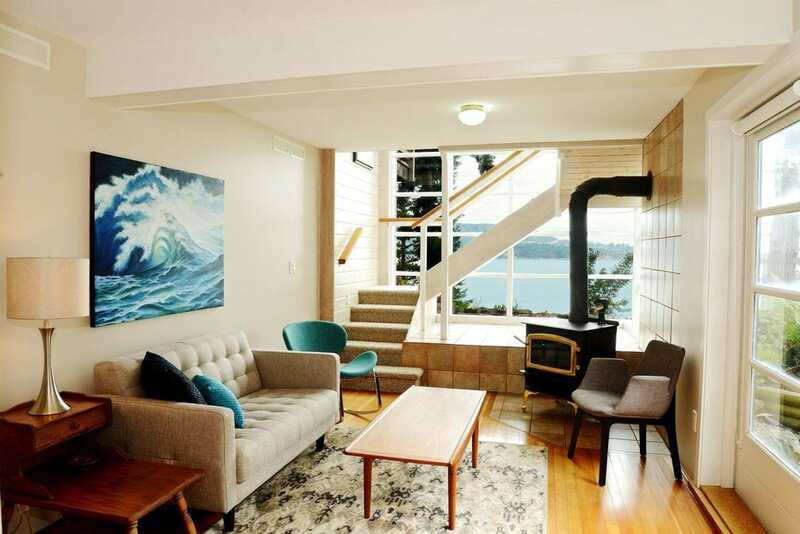 All the décor improvements have contributed to the Eastman Waterfront Cottage being a very popular rental. The Canadiana décor is a favourite aspect for many guests, when deciding to book based on photos, and while they are there on-property, experiencing it. If this experience makes an impact, you'll hear about it, and if you're lucky, so will others. Relocate the hot water heater from the kitchen to the new shed. Install a wood burning stove in the vacated hot water heater space. Not only will the guests love building a fire but it will serve as a secondary heat source when the cottage loses power. Replace existing 60 year old shed with a new insulated shed. The new shed will house a washer and dryer, the hot water heater, and well pump. With each incremental change, the property value improved, and guests were met with better amenities and features. It wasn't hard on the owner's pocketbook because increased income payed for the improvements and resulted in a property that could justify a higher nightly rate. Guests didn't just find a quiet place to stay, but one that many adore for its history, design, and charm… something they let us know about all the time. 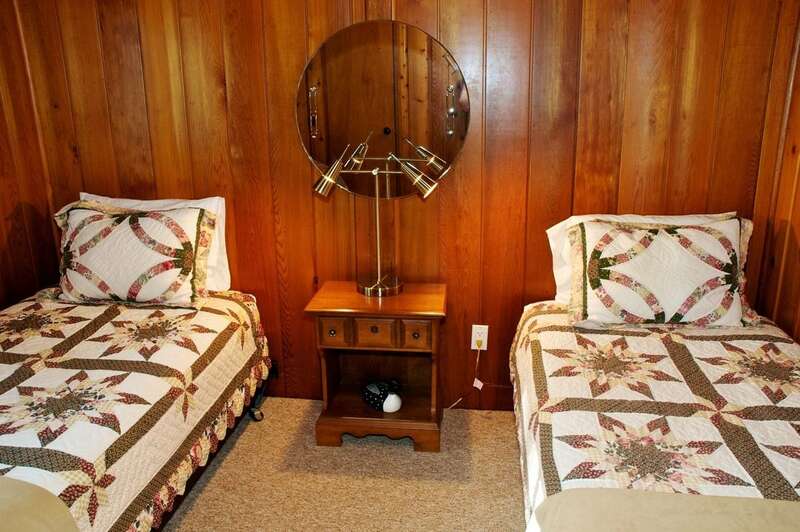 All the Décor improvements have contributed to the Eastman Waterfront Cottage being a highly occupied vacation rental. Comparing 2014 to 2017 the owner has seen over an 87% improvement in his gross income, a 12.5% annualized growth rate. When guests are deciding based on photos, the Canadiana décor is a favourite aspect for many guests. Once in the property they are pleased with the comfort, views, and overall experience. This sequence of events from attracting a potential guest to the guest’s arrival eventually leads to returning guests and positive reviews. Few hear about these results and the numbers don’t lie. Losing a booking to personal taste preferences will happen. 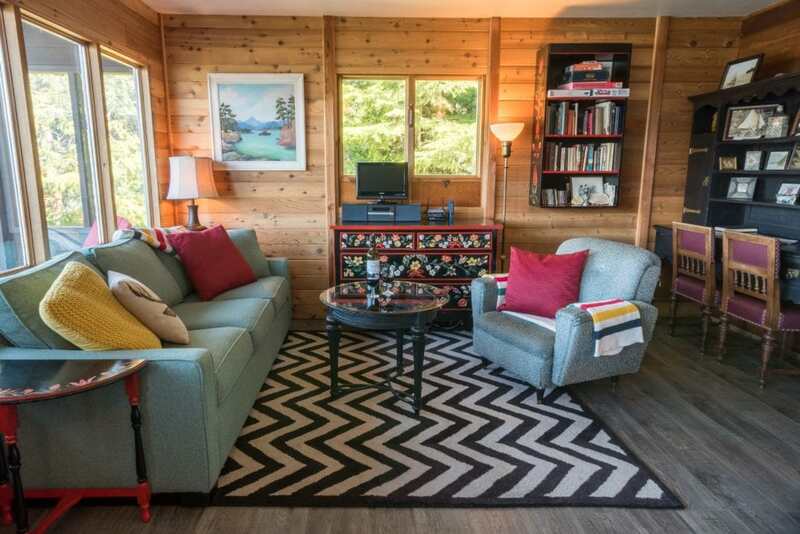 A guest might prefer simple, contemporary, and minimal décor and chose the Lazy B Waterfront Suite over the very colorful, plenty of pattern, Canadiana styled Eastman Waterfront Cottage. This is neither Good or Bad design, and one can occasionally lose a booking because of style preferences, but certainly bookings will be lost due to no consideration for design at all (you just may never hear about these lost bookings). The cost for bad design can be silent and a reason for a lack of returning guests. 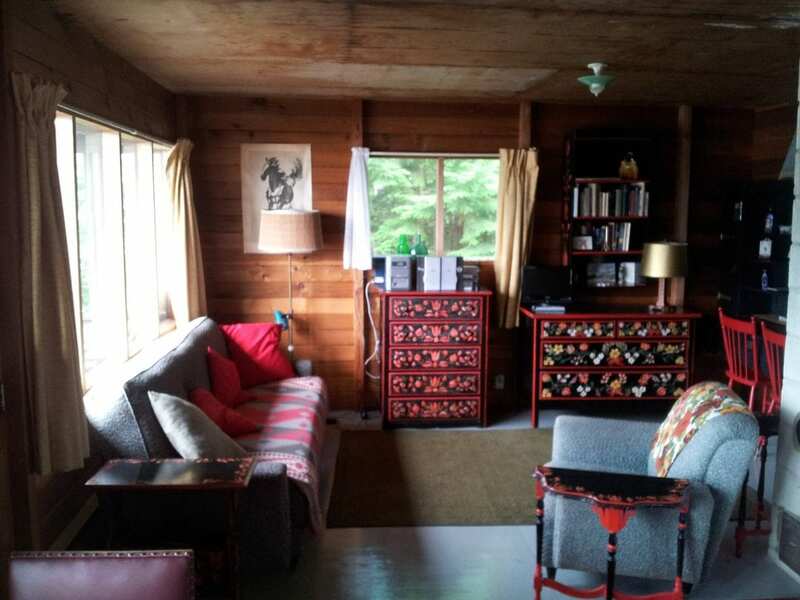 A while back I was fortunate that a guest shared her honest feedback in a private email about the uncomfortable TV sofa at the Hollybarry Cottage. If it was my personal property I would have 1) replaced the settee ASAP and 2) never have purchased it in the first place. Looking good does not replace comfort...both must be included. How many other guests have said nothing but rather left with the memory of not being comfortable, no plans to return, no recommendations and hopefully they have not left their notes of discomfort in a public guest review. ​​​Pictured is an example of an attractively staged TV room, but with a recurring complaint… The room was not comfortable. The owners of the property did not watch TV themselves and so did not give much regard to providing comfortable TV seating. Had I been asked to furnish the room I would have selected a sofa with minimal arms with the right pitch to the back and plush cushions for comfortable lounge TV viewing. The addition of an ottoman in front would have added to the comfort factor. Who doesn’t like to put their feet up? ​Our second example of an “almost lost booking” was a guest that “almost didn’t book the Eastman Cottage because of the Futon sofa.” She wrote to tell me how pleased she was to discover that the futon sofa had been replaced with a real comfortable sofa. She emphasized that when on vacation she likes to be feet up and lounging in comfort. Within days the new living room sofa photo was added to all the picture galleries just in case it was a deal breaker for other potential guests. Today I wonder how many additional bookings have we received because of this important update. What percentage has it contributed to the occupancy? ​Matt's Note: If you may be thinking that one guest's feedback doesn't represent a true data sample, you may be right. But then again, if one guest out of 50 or 100 has the courage and the patience to sit down and share with you their concerns, how many of the other guests felt the same way but chose not to share? Take single guest feedback very seriously. Below left is the futon that we attempted to doll up with a cozy Hudson Bay throw and down toss pillows. Even then the guest noticed the uncomfortable futon. Now that we actually had feedback we expedited the photographing of the new comfortable living room. 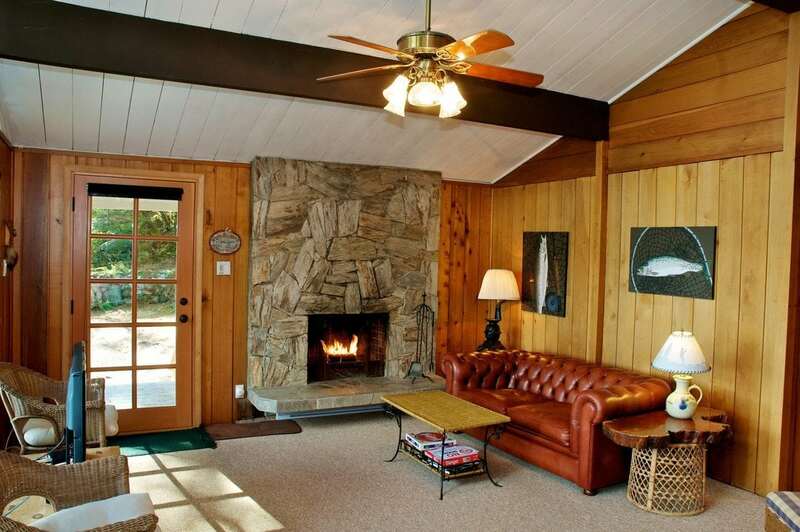 The comforts of home are a major element in my "must haves" to good vacation rental design. Expressing comfort through the photos first. And then, once the guests live in your rental, will the guests remember how comfortable they were while relaxing and watching TV or gazing at the view? If when the guest checks out and raves about the coziness of our homes this means we have cleared the comfort hurdle. An online buzz based on a guest's happy stay is always a plus. All it takes is a renter sharing a photo on social media. 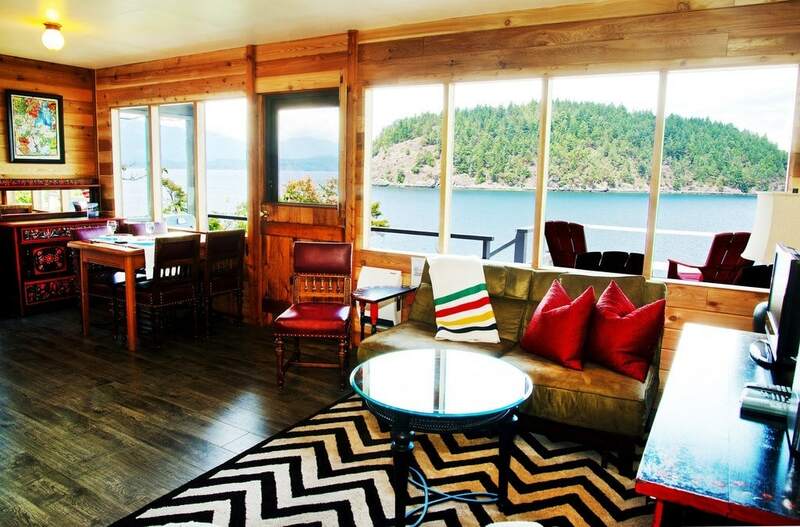 This Instagram photo-share of the Eastman Cottage living room was posted by a guest, and noticed by the tourism representative for Destination BC; the guest even recommended she stays there. All the "likes" on a great interior photo are potential future guests. Having guests moved to post photos of your great décor on social media widens your audience (as opposed to the owners and managers constantly posting to the same crowd). We took advantage of this by letting the commenters know how to get to our website. You can see in this last comment that décor was a point of comparison for this guest, making it a reason to book with us. And in the second comment, the guest states their intention to return. Twenty five percent of our income is generated from returning guests, some as many as 18 times! From their feedback, we know it's not just Bowen that's calling them back, but their homey experience in our properties that makes them choose us over the competition. The ​financial evidence we have is difficult to isolate and to quantify as good interior décor is one of the many tools we use to maximize our rental income. We do know that 4 of our properties that have been staged and professionally designed are consistently listed as top properties in the search results for VRBO. To wrap up, why does good design matter? It broadens your potential guest market as you will capture guests that are décor connoisseurs as well as those where décor isn't a priority. We as Vacation Rental owners and managers are always looking for ways to be ahead of our competition. Why not have our interior décor be better too? It is a competitive market and travelers have plenty of choices. The Online Listing Sites are making sure the travelers are exposed to other vacation rental options. Capture and keep their attention with an attractive, imaginative, colorful and/or gorgeous interior. Gain social media attention with memorable interiors. The more looks, the more attention and interest your property receives will ultimately lead to more income for you, the owner. This is a tool to be used to maximize your rental income. The bottom line……….Include attractive décor as a major tool just like you pay attention to listing text, SEO, amenities, web design, and reviews. We know it will increase your inquiries and ultimately your profits. Stay tuned for our future blog posts that will focus on How to achieve better interior design on your own. 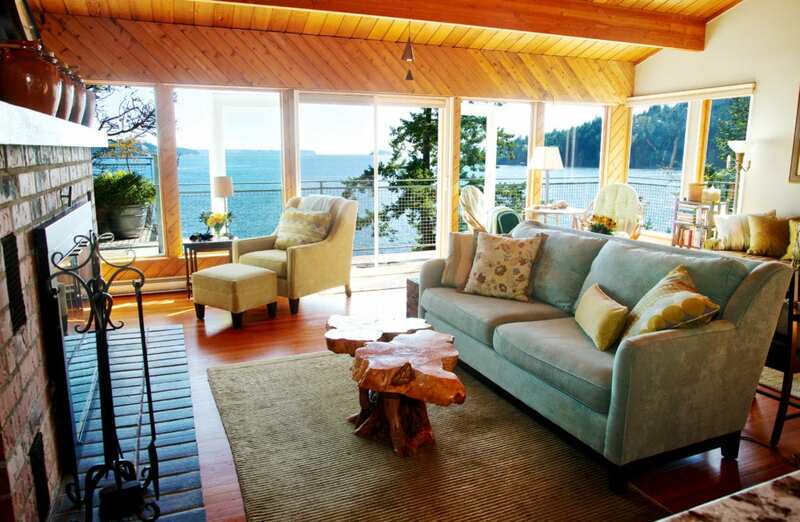 Jan Stevens​ is the owner of Bowen Island Accommodations, a professional residential interior designer of over 40 years. For the past 14 years Jan has specialized in Vacation Rental Interior design and marketing. You can view her portfolio at JanStevensDesign.com.